TextView is used to display text in android application. In website we can see different types of font and text styles like that we can also add different style inside textview (in android text). 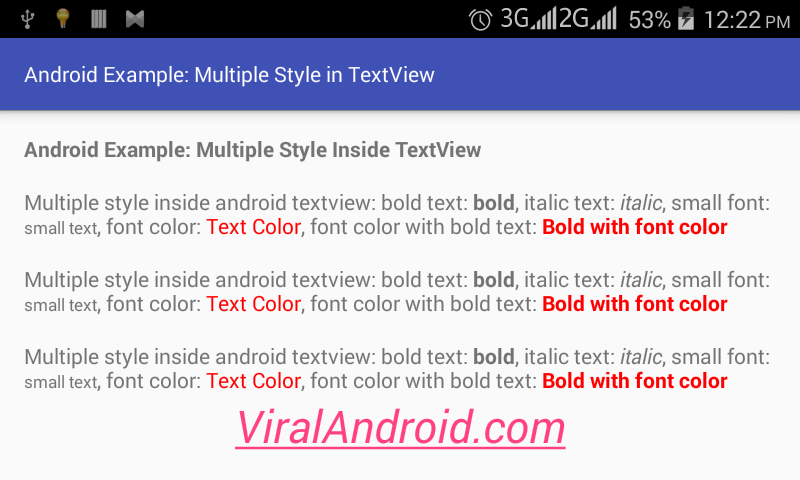 In this tutorial you will learn to make multiple styles in android TextView text with different method like bold text, italic, text color of specific word, etc. There are many ways to make multiple styles inside android TextView and in this example I have made multiple style with three different ways using HTML tags and Html.fromHtml(). Following is the example code to make text bold, italic, color of specific word, small text, etc in android textview text. Following is the content of java activity file. Now, run your Make Multiple Styles Inside Android TextView application and see how it looks. You can see some bold text, italic text, small text, color in some word, etc.